Sub: Govt. 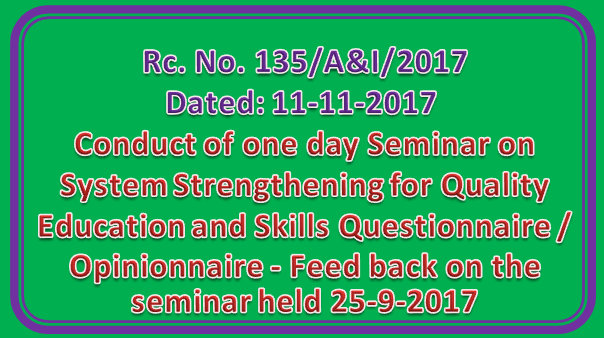 of Andhra Pradesh — School Education Department and Kovida Ltd., Hyderabod - Conduct of one day Seminar on System Strengthening for Quality Education and Skills — Questionnaire / Opinionnaire - Feed back on the seminar held 25-9-2017 at Secretariat, Velagapudi - Request — Regarding. and Managing Director. Kovida Ltd.. Hyderobad — 500082. The attention of the under mentioned Regional Joint Directors of School Education / District Educational Officers / Principal, IASE, and DIETs is invited to the reference 3rd read above, wherein M/S Kovida Ltd, Hyderabad furnished questionnaire / opinionnaire to them through email and requested to furnish their valuable feedback and opinions on various subjects discussed in one day seminar conducted jointly with Govt. of A.P. on 25-9-2017 at Secretariat. But M/S Kovida Ltd. Hyderabad has informed that, no information / feedback received their end so far. They are therefore requested to furnish filled questionnaire / opinnionaire to through email to M/s Kovida Ltd, Hyderabad duly extending a copy of the same to this office immediately.